Wow.. you can really make out the highlands on the far side of the moon. Don't read anything into that, those are ringing artifacts due to the deconvolution process. The high resolution imager on the spacecraft had a design flaw similar to Hubble's mirror that caused all the images to be very blurred. This sequence had processing applied to at least partially recover from the blurring, the ringing is the side-effect. Split the gif into individual frames (I used ezgif.com/split) to illustrate that.. The lander was expected to shut down the engine 4 meters about the ground and then to the ground (see for example this page). But the movie seems to show the lander touching down and leaving the engine ON for about 10 more long seconds. What happened? He ZHANG (Deputy chief designer of Chang'e 3, mainly responsible for the landing system): Chang'e 3 is working well, everything is functioning well, moon-besed EUV imaging started working. Press: Has Yutu avoided the crater ahead? He ZHANG: After seeing that crater, we felt very lucky as well as successful. Apart from the crater, there are some stones around as well. However the landing spot is very flat. It means our system worked well. The crater is bout 10m away, Yutu should be able to avoid it. Yan SU (National Astronomical Observatories, Chinese Academy of Sciences): 6 of 8 instruments have been functioning. They are Descent Camera, MastCam, Lunar-based Ultraviolet Telescope (LUT), Ground Penetration Radar (GPM), PanCam, Extreme Ultraviolet Imager (EUV). Press: When can we explore the Mars? Weiren WU (Chief designer of Lunar project): We're capable of exploring the Mars already. However, when we're going to do it will be decided by the state. Yan SU (Ground application system, National Astronomical Observatories): We will release sharing data at the earliest possible time.We have been cooperating with ESA, however it's difficult to cooperate with NASA because of its policy. Weiren WU: The data will be classified as 4 levels. U.S. Congress forbids NASA cooperating with CNSA. 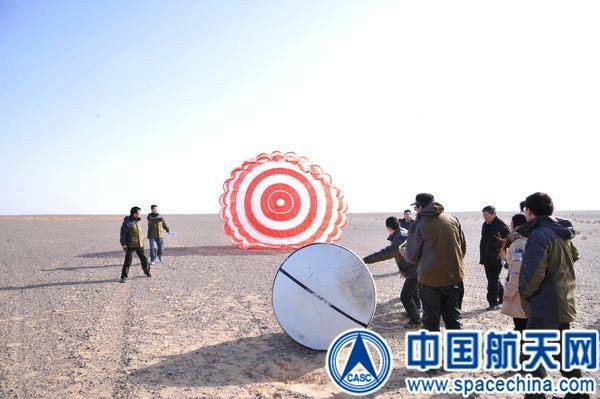 NASA had asked Chang'e's trajectory data before the launch, however they refused to provide the trajectory data of their own orbiters. Press: Aprat from ESA and NASA, do we cooperate with Russia, India, Japan and South American countries? Weiren WU: We work with ESA, but not NASA. We also have some cooperation with Russia. To work with others, we always need to improve ourselves. Press: What if Chang'e 3 failed? Weiren WU: We tried our best, but we also prepared the worst. We had more than 200 troubleshooting plans. But in the end, none of them was used. We would be under immense pressure if it failed, however we believed Chinese people would understand. He ZHANG: Both USA and former USSR had some failures. However we have the benefit of much improved technology. We used laser rangefinder, 3D laser imaging sensor. They didn't have them in 1960s and 1970s. The main feature of the landing is autonomous obstacle avoidance. There was a carter, 20m diameter, 2 or 3 metres deep. Chang'e 3 successfully avoided it. Chang'e 3 could take three 3D photos, however it wasn't too difficult, so it took only one 3D photo. The computer quickly identified the safe spot, Chang'e 3 panned a little, then landed. Press: Chang'e 5 will be launched in 2017, will it take another rocket to bring the sample back? He ZHANG: The rocket will be almost as twice powerful as Chang'e 3's (1000t vs 600t). Yes, there will be another "little rocket" to bring the sample back, although we don't called it as such. It's very difficult new technology. It's still under development. Press: What are the further tasks for the lander? He ZHANG: There's a moon-dust integrated load measuring instrument on the lander which will collect moon-dust for a year, so we can analyse the data coming from the lander. To work for a year, the lander has a RHU radioisotope thermoelectric heating system which can keep the temperature in the cabin to minus 30-40 degree during the night. Press: Chang'e 3 has been such a success, what's the point to fly Chang'e 4? Weiren WU: We will certainly make some alterations for Chang'e 4 to suit the purposes. We will need more discussion about it. Press: Any major technical differences between Chang'e 5 and Chang'e 3? Weiren WU: Lunar orbit rendezvous and docking, sample taking and drilling, sample packing and preservation, returning to the Earth. There was speculation earlier in the thread that although the engine was off, there was still some remaining gas escaping. I think it was a great translation! Thanks a lot, some nice information in there! Overall they seem very humble and I hope for some NASA/CNSA cooperation in the future, as scientists on both sides seem to just want to work together. Drilling on Chang'e 5, awesome! Images of the Moon taken from ISS also often show such a pale brown color, although I don't know the specific camera white balance settings used. I can't speak for Apollo Hasselblad photography other than it looks spectacular. Also both Neil Armstrong and the Apollo 12 crew reported the moon looked brown from certain angles and heights early in the lunar morning (for Apollo 12, on the second EVA). Neil said that when he held the lunar soil in his hand up close, it look gray. This was in an interview with Patrick Moore shortly after Apollo 12. The Apollo 10 crew reported brown many times from orbit at low sun levels. Seconded, thank you very much. ! Test of the reentry vehicle for CE-5. Thanks for posting that video. Some screen captures. The first showing a descent camera image with a drawing of Chang'e 3 and Yutu imposed on it, the second showing Chang'e 3 marked with a red cross I've added (that's a fairly big crater that it landed next to) and the last showing Chang'e 3 relative to Luna 17 which carried Lunokhod 1. Data sharing with PDS as they did with Change-1 and 2 mentioned again too. I was looking at images of the Yutu rover and how the mockups compare to the real thing. I noticed that the wheels changed in design completely. I believe there were two competing rover designs. The one you showed could have been the losing design. To get back to Chang'e, I'm not that surprised the moon turned out brown. Every time I worked with spacecraft color imagery of the Moon, if I white-balanced it to the solar spectrum in vacuum, I got a similar brown color, whereas things like ice would turn out white. Same for Mercury. To be honest not quite sure how you arrived at that as it doesn't gel with Apollo Hasselblad images. 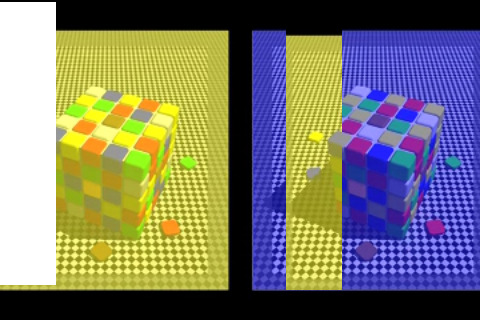 It's just the way it is when using calibrated reflectance (I/F) data. The Moon invariably appears more reflective in the red end of the spectrum than in the blue end. If it was equally reflective, a RGB composite of such I/F data would end up perfectly grey (and it does do so for some Saturnian icy moons). I know this is at odds with how the moon appears to our eyes on the ground, but that's the end result when you put in a "hard" limit on the white balance, in this case completely dividing out the Sun's visible spectrum and don't do any other tweaks like a human eye probably would. I suspect Chang'e 3 cameras are operating in this mode. Hence why I said I wasn't very surprised at the outcome. Thanks for posting that link. I really love that video from Deep Impact. However, the visible detectors in the Medium and High Resolution Imagers (MRI & HRI) on Deep Impact sat behind filter wheels. The filters were the Hale Bopp standard filter set. (see http://adsabs.harvard.edu/abs/1997DPS....29.3213M "The new narrowband comet filter set, designated the "Hale-Bopp set'', consists of 11 filters: five that isolate gas emission bands (OH, NH, CN, C_3, and C_2), two for ions (CO(+) and H_2O(+) ) and four that isolate associated continuum bands") The DI PI, Dr. Michael A'Hearn, helped develop that set, which was used by astronomers around the world so that their data would all be easy to compare and to aid in retrieval of those chemical species. They were not selected to make aesthetically pleasing, natural color images. I believe that the movie was created from pairs or triplets of the images, color and exposure balanced to some degree. Remember that the Bayer pattern filters on standard color imagers, particularly the red filter, have significant leakage and response to other colors. As objects shift around around the color chart odd responses can happen. I have not read enough to know if the rover and lander have color detectors or monochromatic detectors with filter wheels, or if filters, what bands were chosen. The Chinese could have mounted a quantitatively verified white surface, like a ceramic tile, on protected locations on the rover and lander, for each other to image. They have certainly seen that on US Mars landers. They chose not to. I noticed that the wheels changed in design completely. The alternative rover design that Steven refers to looked substantially different - the elastic wheels may have been a late addition to the winning design. Why have my post containing example of color optical illusions been deleted?!? It was on topic! Do you think someone on the APOD team has been reading our discussion on the colour of the Moon?? I created a Google Earth simulation of the landing which includes known objects allowing figuring out image scale. I'm currently trying upoloading it somewhere, in the meantime you can look at some screenshots. If you get better result I'll be glad to replace my video by yours. 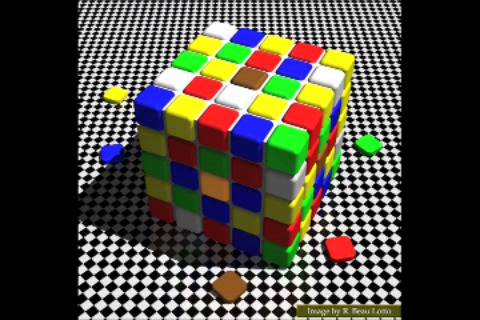 the center rectangle of front and top side are exactly same color: verify using your favourite image editor. 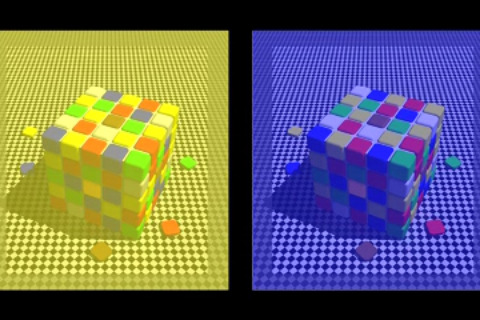 "Blue" boxes of top side of left cube are exactly same color of "yellow" boxes of top side of right cube! same images of the moon appear different depending on background colors!